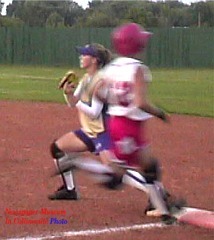 Taylor Whisenhunt (above) is just a blur as she rounds third and heads for home to end the second game with Mannford. 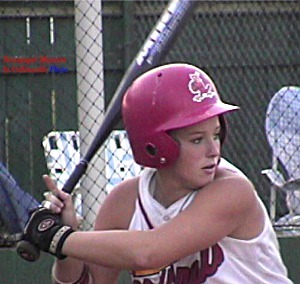 In the photo on the left she can be seen leading off the second game which Collinsville won 1-0 in eight innings. 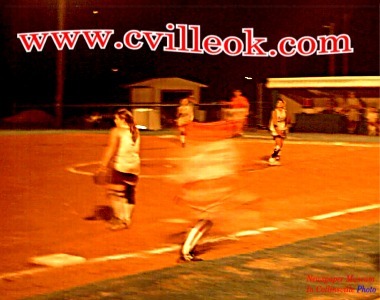 Collinsville won both games of a doubleheader with Mannford here September 16th. The Lady Cards won the first game 3-0. The second game was scoreless going into extra innings. The Cardinals missed a scoring opportunity in the sixth when they had runners at 2nd & 3rd with 1 out. 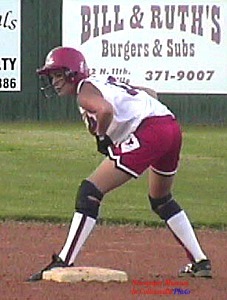 Erica Holly had been hit by a pitch and then moved to third on a double by pitcher Kelli Dunagan. A hard liner back to the pitcher doubled Holly off third to end the inning. Collinsville held Mannford scoreless again to start the eighth. In the Cards half of the eighth, Jessica Carney grounded out for out number one. Taylor Whisenhunt doubled to the wall. Hillary Brown grounded out for the second out. Erica Holly drew a walk. 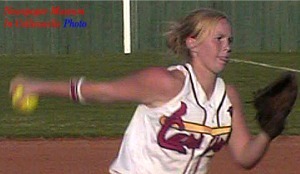 Kelli Dunagan hit another double to the wall which sent Whisenhunt home with the games only run.